You can't get anywhere on your own. 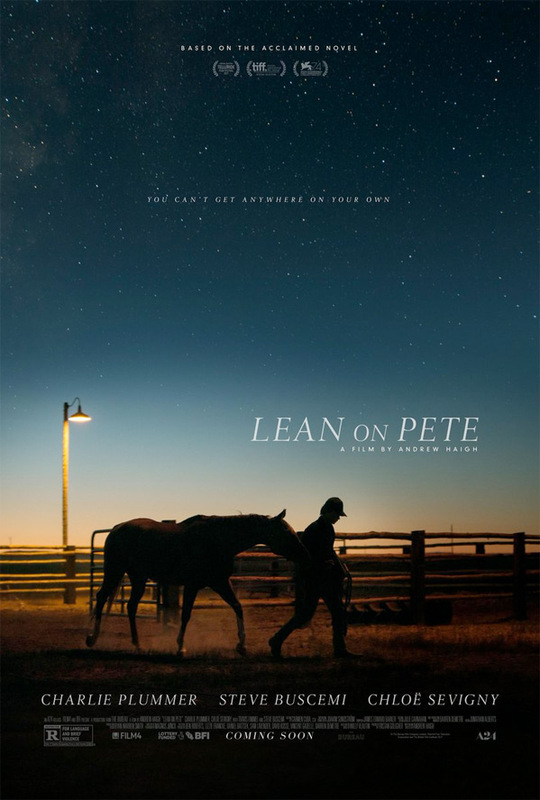 A24 has revealed the first official trailer for an indie drama titled Lean on Pete, which premiered at the Venice Film Festival this year and also played in Telluride, Toronto and London. Andrew Haigh is the critically acclaimed filmmaker behind Weekend and 45 Years, and this is his latest touching drama about a lost boy from Oregon. Charlie Plummer stars as Charley, a teen who befriends a race horse named Lean on Pete. The full cast includes Steve Buscemi, Chloë Sevigny, Travis Fimmel, Amy Seimetz, Steve Zahn, Thomas Mann, and Alison Elliott. I saw this in Venice and it's a good film with some solid performances, but it didn't really win me over in any way. It's just a simple story about a lonely, lost, struggling boy who finds some hope in a horse he befriends. It's definitely worth a look. The film follows fifteen-year-old Charley Thompson. He wants a home, food on the table and a high school he can attend for more than part of the year. As the son of a single father working in warehouses across the Pacific Northwest, stability is hard to find. Hoping for a new start they move to Portland, Oregon where Charley takes a summer job, with a washed-up horse trainer, and befriends a failing racehorse named Lean on Pete. Lean on Pete is both written and directed by acclaimed English filmmaker Andrew Haigh, of the film Weekend, 45 Years, "Looking", and a few shorts previously. Adapted from Willy Vlautin's novel. This first premiered at the Venice Film Festival this year, and also played at the Telluride, Toronto and London Film Festivals. A24 will release Lean on Pete in select US theaters starting on April 6th, 2018.